Batman: Arkham Knight is the third iteration of Rocksteady Studios hugely successful franchise, and the epic conclusion to their trilogy. It has been developed exclusively for New-Gen platforms, and it introduces Rocksteady’s uniquely designed version of the Batmobile. The addition of the legendary vehicle elevates the acclaimed franchise to a whole new level, as Batman has to face a united front of villains brought together by Scarecrow, to take Batman down for good. The Official Batman: Arkham Knight Trailer – “Gotham is Mine” features a closer look at some of the story’s most infamous super-villains. As Scarecrow unites the Rogues Gallery, including Two-Face, The Penguin, the Riddler, the Arkham Knight, Harley Quinn and Poison Ivy, they bring all-out war as they try to take down The Dark Knight, and claim Gotham City as their own. Scarecrow is the mastermind behind the gathering of Gotham’s super-villains, and it is quite apparent Batman: Arkham Knight paints a grim picture. The darker mood and depressing atmosphere is present and noticeable enough to warrant that the recently acquired “M” rating is justifiable. The emotional tone in the latest iteration of the Arkham universe appears to build up a far darker setting than its predecessors, and likely a series of events that will bring Batman under more dire circumstances. The huge jump in visual quality is evident in everything in Batman: Arkham Knight, from the incredibly detailed character models to the entire rainy city of Gotham. The amount of quality that the team at rocksteady, managed to achieve from their heavily modified Unreal 3 engine, is immense. • “Be The Batman” — Live the complete Batman experience as the Dark Knight enters the concluding chapter of Rocksteady’s Arkham trilogy. Players will become The World’s Greatest Detective like never before with the introduction of the Batmobile and enhancements to signature features such as FreeFlow Combat, stealth, forensics and navigation. • Introducing the Batmobile — The Batmobile is brought to life with a completely new and original design featuring a distinct visual appearance and a full range of on-board high-tech gadgetry. Designed to be fully drivable throughout the game world and capable of transformation from high-speed pursuit mode to military grade battle mode, this legendary vehicle sits at the heart of the game’s design and allows players to tear through the streets at incredible speeds in pursuit of Gotham City’s most dangerous villains. This iconic vehicle also augments Batman’s abilities in every respect, from navigation and forensics to combat and puzzle solving creating a genuine and seamless sense of the union of man and machine. • The Epic Conclusion to Rocksteady’s Arkham Trilogy — Batman: Arkham Knight brings all-out war to Gotham City. The hit-and-run skirmishes of Batman: Arkham Asylum, which escalated into the devastating conspiracy against the inmates in Batman: Arkham City, culminates in the ultimate showdown for the future of Gotham. At the mercy of Scarecrow, the fate of the city hangs in the balance as he is joined by the Arkham Knight, a completely new and original character in the Batman universe, as well as a huge roster of other infamous villains including Harley Quinn, The Penguin, Two-Face and the Riddler. • Explore the entirety of Gotham City — For the first time, players have the opportunity to explore all of Gotham City in a completely open and free-roaming game world. More than five times that of Batman: Arkham City, Gotham City has been brought to life with the same level of intimate, hand-crafted attention to detail for which the Arkham games are known. • Most Wanted Side Missions — Players can fully immerse themselves in the chaos that is erupting in the streets of Gotham. Encounters with high-profile criminal masterminds are guaranteed while also offering gamers the opportunity to focus on and takedown individual villains or pursue the core narrative path. • New Combat and Gadget Features — Gamers have at their disposal more combat moves and high-tech gadgetry than ever before. The new ‘gadgets while gliding’ ability allows Batman to deploy gadgets such as batarangs, the grapnel gun or the line launcher mid-glide while Batman’s utility belt is once again upgraded to include all new gadgets that expand his range of forensic investigation, stealth incursion and combat skills. You can watch or download an uncompressed version of the trailer over at Gamersyde. More information regarding Batman: Arkham Knight’s “M” rating can be found here. 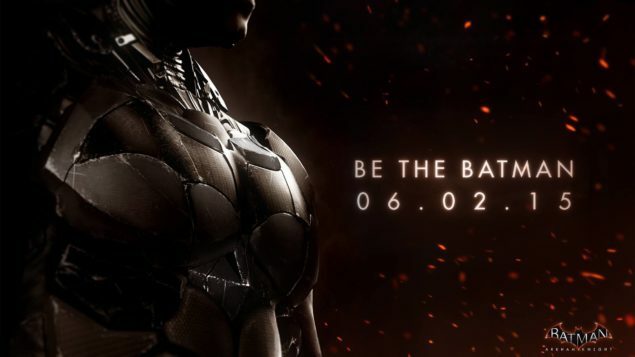 Batman: Arkham Knight is stated for a June 2nd release date for the PC. PlayStation 4 and Xbox One platforms. We will bring any additional information prior to the games’s release as it becomes available.